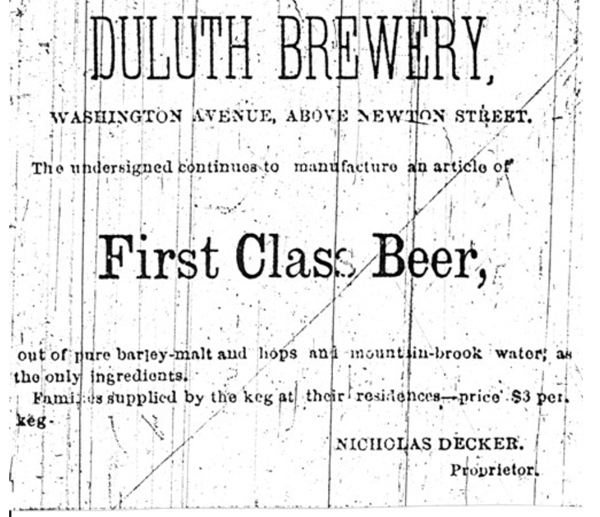 Duluth’s Decker Road is named for Benjamin Decker, who had a market farm and greenhouse on the road in the early part of the 20th century. The road was originally called “the Decker road”—short for “the road to Decker’s farm”—and it was built in 1915 as a connector for rural Duluth market gardeners to get their produce to the city center. The landlord has been gravely suggesting to some of his lodgers the advisability of adopting a plan of economizing space and bed clothes, which, he says, prevails in the larger cities of Germany, where he came from! This is, to obtain a couple of two inch ropes and stretch them across the rooms: at suitable spaces apart near the floor, so as to accommodate men of the average size lying across them heads downward and eighteen inches apart, with a rope for their foreheads and another rope across the middle of their bodies, their feet resting tip-toe upon the floor—no bed clothes being necessary, as nobody will undress, and they will keep each other warm as hens do by the animal electricity! Landlord Decker tells it “for a fact,” that such a cheap lodging he has seen in the old country, the charge there being but about half penny per night; and he thinks he could afford it here for about five cents a night, with meals thrown in at 50 cents each! I have planted gardens in Duluth generally from the 5th to the 20th of May; occasionally as early as April; and never failed to raise a good crop of vegetables, even of tomatoes. Last spring (1868) I planted gardens on the 5th to the 15th of May. I raised ripe tomatoes, cucumbers, snap beans, squashes, pumpkins, cabbages, carrots, beets, potatoes, melons and pot herbs. I can raise any vegetables here I ever saw raised anywhere in the temperate regions—they grow quickly and are sweet and good.